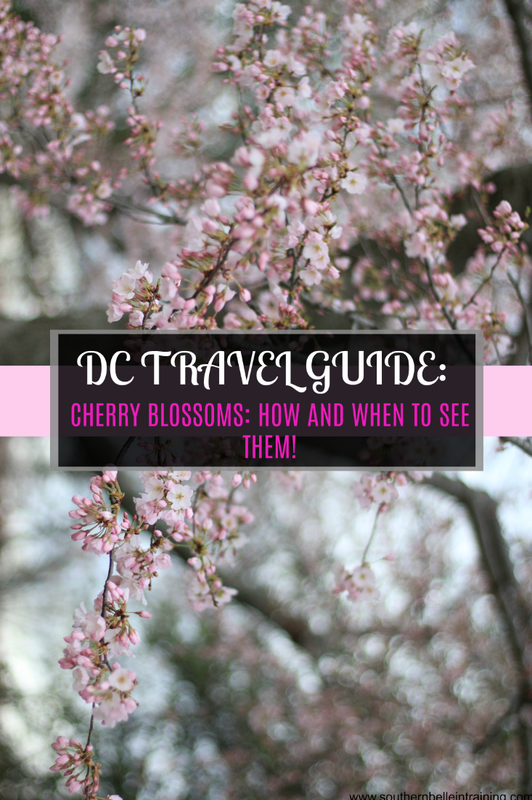 DC TRAVEL GUIDE: Cherry Blossoms - How + When to See Them! Sharing all the details today about one of the best things I've ever crossed off my US travel bucket list! I knew that I'd love seeing the cherry blossoms in bloom in Washington DC, but I had not idea just how much I'd love it. I can't remember exactly when I started to become obsessed with the idea of visiting DC in early spring 2018 to see the cherry blossoms. I'm guessing that it was around late fall or the holidays in 2017... aka right around the time that the temperatures dropped drastically in Vermont, and all things SPRING related were on my mind 24/7. A trip to DC when the famous cherry blossoms were in bloom seemed about as perfectly spring of a destination as I could envision! My friend Mercedes works and lives in DC, and I knew that a weekend trip to see her in early April could be doable. All winter long I was browsing flights from Vermont to DC. As I've mentioned before on the blog, the Burlington airport is insanely expensive to fly anywhere, so by early February I still hadn't bought a flight and I was hoping the ticket prices might drop at the last minute. Good news came my way in mid-February when I received the offer for my new job in Charlottesville, VA! Charlottesville is only two hours from DC, so it solidified the fact that my cherry blossom sighting dream would come true, and sans expensive flight from Vermont! 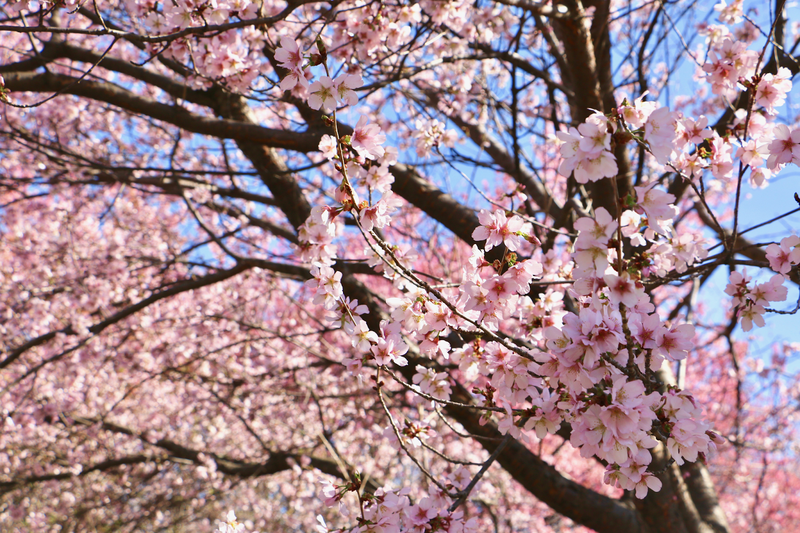 WHEN CAN YOU VISIT THE CHERRY BLOSSOMS IN DC? This year's annual Cherry Blossom Festival in DC runs from March 17-April 15th 2018. Peak bloom week for the blossoms can run anywhere in the dates of the annual festival, and I started tracking predictions for peak blooms a few weeks ago. (It felt like a repeat of when I tracked Vermont's peak foliage week in the fall!) Originally, it was predicted that the trees would blossom early this year, due to a mild February. Then DC (and much of the South- Charlottesville included!) received some surprising snow on the first day of spring, which obviously set the cherry blossoms back again. Their new predicted peak week was near the end of the festival, but the trees changed their minds again, and Easter Weekend ended up being Stage 5 for blossoms (which means right before peak!) - so a great time to be in DC and seeing them when I did!! I really lucked out with the timing of my trip. I will say- Easter is my favorite holiday, so I did think it was especially magical to see them on Easter Sunday! IS IT FREE TO SEE THE CHERRY BLOSSOMS? YESSS!! How amazing is that?! I was blown away in DC by how many amazing things there are to do that are completely free. 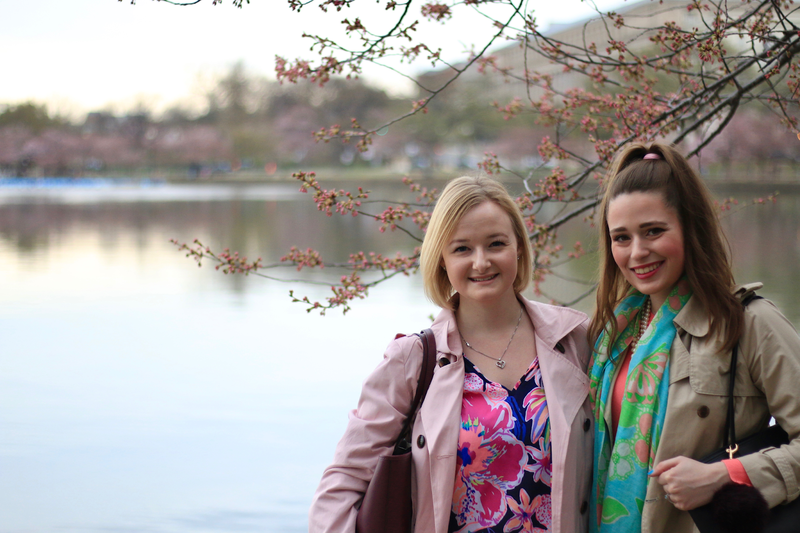 Visiting the cherry blossoms at both locations that I'm sharing in today's blog post is absolutely free! Of course, transportation to said locations isn't, but you have a plethora of options for that; Metro, Uber/Lyft, Hop-On-Hop-Off busses, cabs, driving... etc! 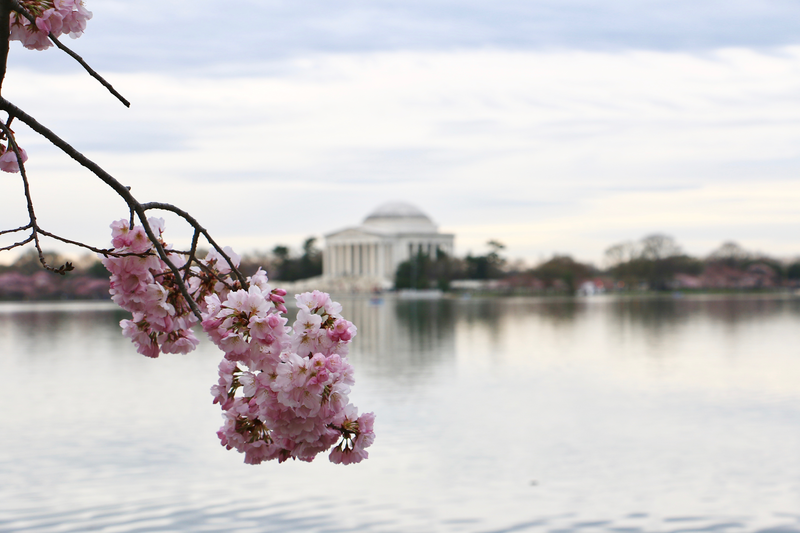 WHAT ARE THE EVENTS FOR THE NATIONAL CHERRY BLOSSOM FESTIVAL? 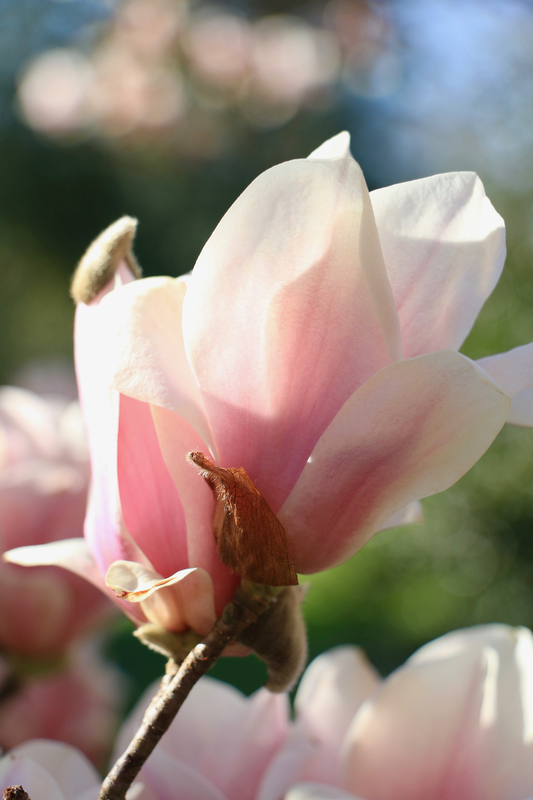 DC loves their blossoms so much that there is a month long festival with all sorts of fun events and activities! Some are free and some require tickets. Mercedes and I actually didn't attend any of the festival events- we found there was more than enough to enjoy just by seeing the cherry blossoms, photographing them and taking in the sights! 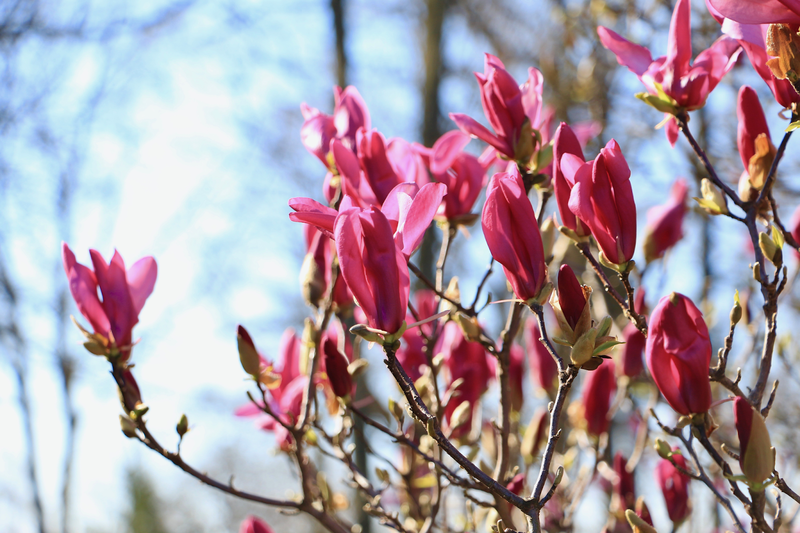 But if you do want to attend events related to the blossoms, there are lots to choose from throughout the month. 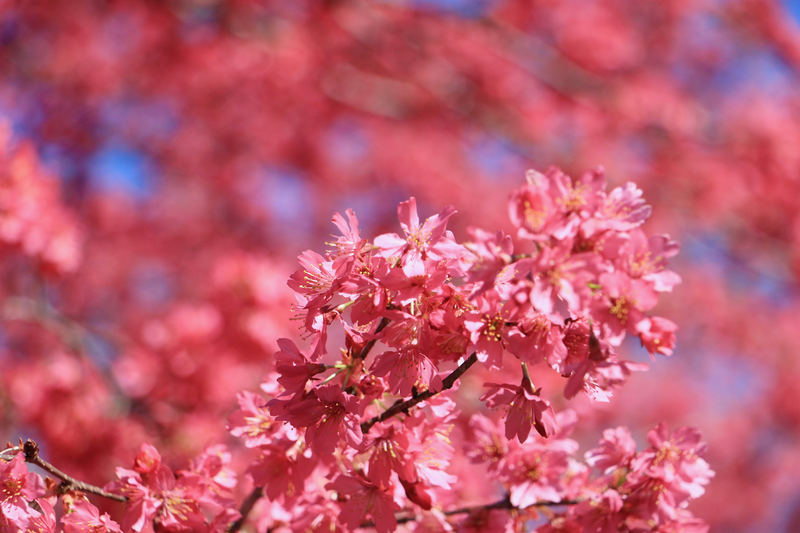 The National Cherry Blossom Festival official website is your best resource with their calendar of events! 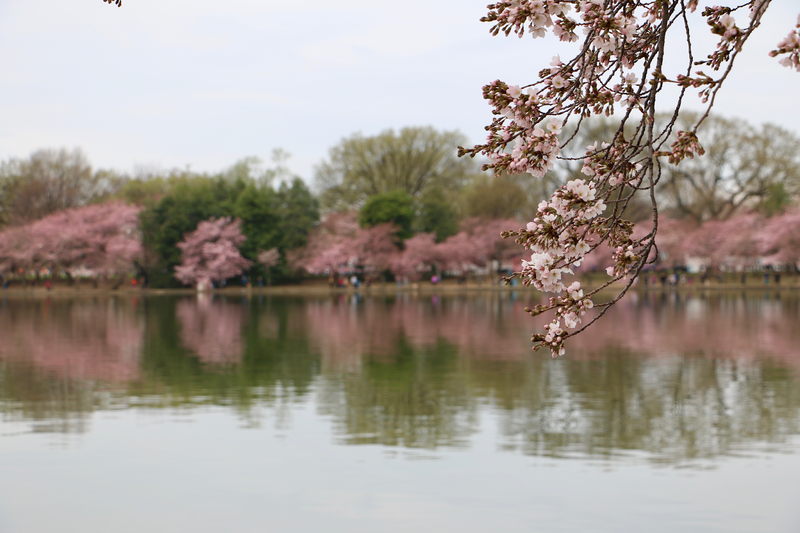 The Tidal Basin is the famous spot to see the cherry blossoms in DC, but there are lots of "hidden spots" to catch the blooming trees throughout the city as well! The National Arboretum is one of them, and Mercedes and I were excited to check it out on Saturday in the late morning. Our Uber driver ended up dropping us off kind of at a back entrance to the Arboretum, so it was a little weird when we showed up... but we just started walking and then soon found ourselves amongst stunning blooms! The National Arboretum has all different traditional gardens and tree gardens. 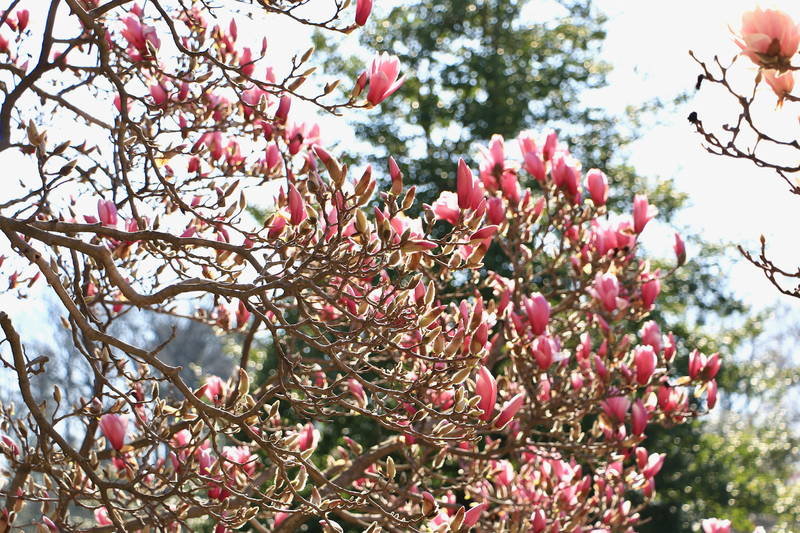 There is a self-guided cherry blossom tour with different varieties of blossoms all throughout the Arboretum. Another BIG highlight of coming here was getting to see the Holly and Magnolia collections. 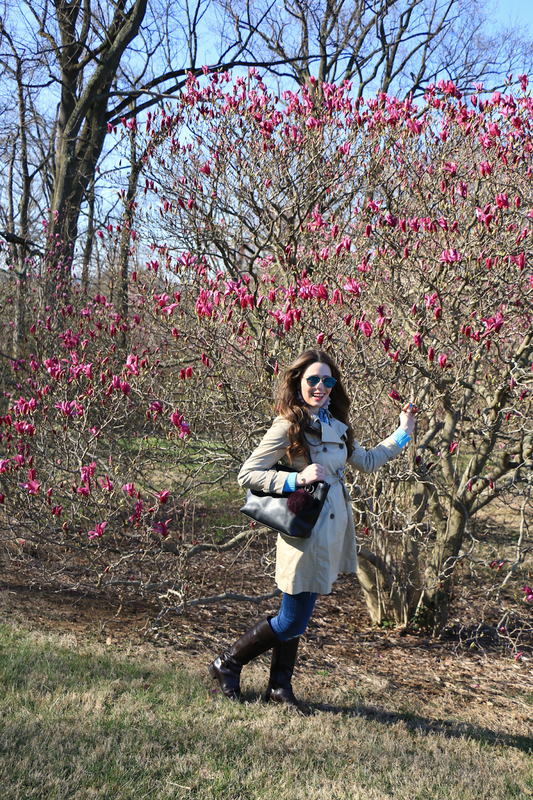 I felt like I was in a Southern dream garden... these trees were so beautiful that they literally look my breath away! After getting our fill of blossoming trees, Mercedes and I also checked out the National Herb Garden and the famous columns that the Arboretum is home to. 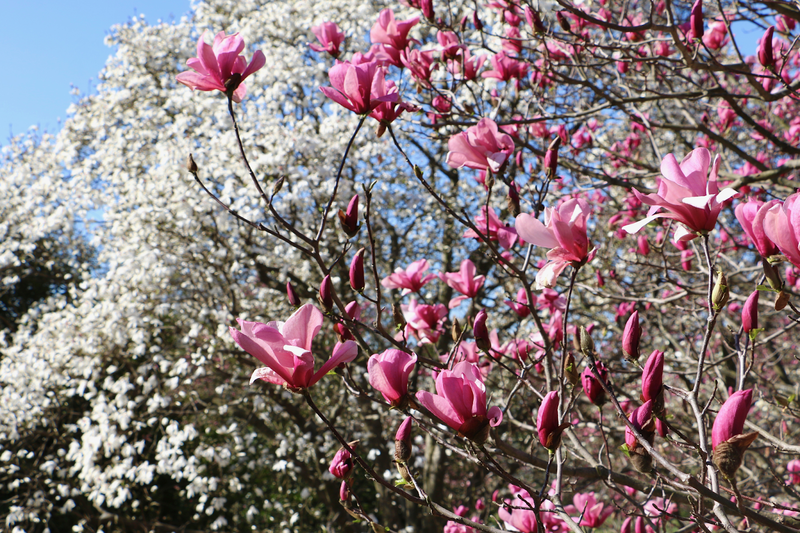 Out of all the things we saw there- I think the magnolias were my favorite! This is the iconic place to see DC in bloom!! Most of the of the depictions of the cherry blossoms promoting the festival in art or photography are normally depicted at the Tidal Basin. Mercedes and I headed there on Easter Sunday morning, hoping that it would be slightly less busy that morning due to the holiday. It was still pretty crazy! A much different experience than seeing the trees in the peace and quiet at the National Arboretum. But still absolutely incredible. Despite having lots of other tourists around, we were still able to get some amazing shots. 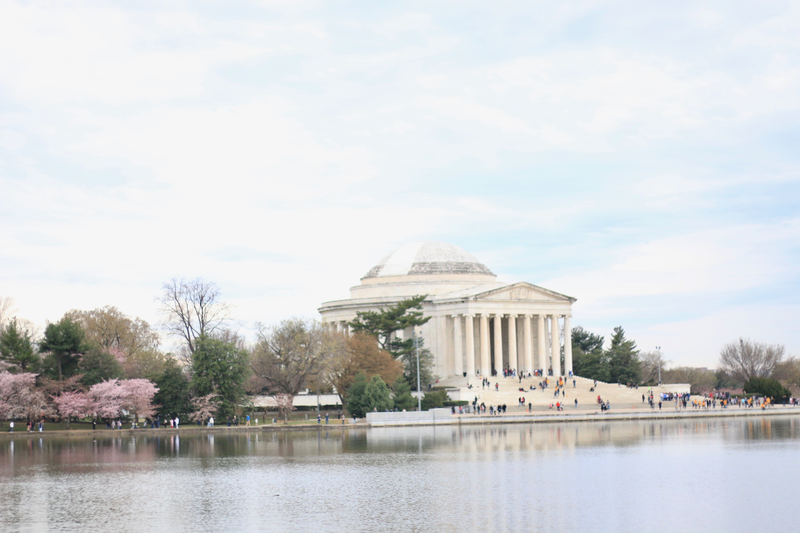 We walked almost the entire length of the Tidal Basin and checked at the Jefferson Monument, and it was about a 2.5 mile walk. Parking is limited near here the Tidal Basin during the National Cherry Blossom Festival - Mercedes lucked out finding a parking spot after we drove around a couple times. 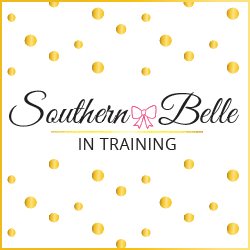 I'd recommend taking an Uber or other transportation method if you visit on a weekend like we did! 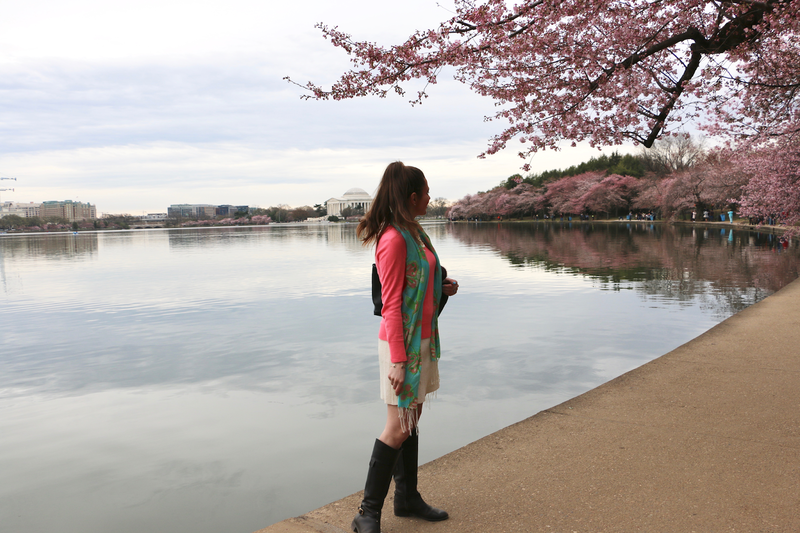 Thanks so much for reading my DC Cherry Blossoms Travel Guide! Have you visited DC in March/April before to see these beauties in person? This is a bucket list item of mine. I def need to get to DC in the next few years to see them. I'm only in PA so it's not that far of a drive. I love D.C. You did such a great job with this post. I love all the pictures and details. I need to go back soon. This makes me miss it. I LOVE DC SO MUCH! My sister in law lives in Old Town Alexandria now but just moved from Arlington. And my husband's best friend is in Manassas so we get up there a couple times a year. We tried to catch the blossoms last year and were a week too early (and post freeze) so they weren't all out! So its on my list for next year!! i've always wanted to go to this, too. looks like you timed it right! This is so beautiful!!! I need to experience this asap. Great post! 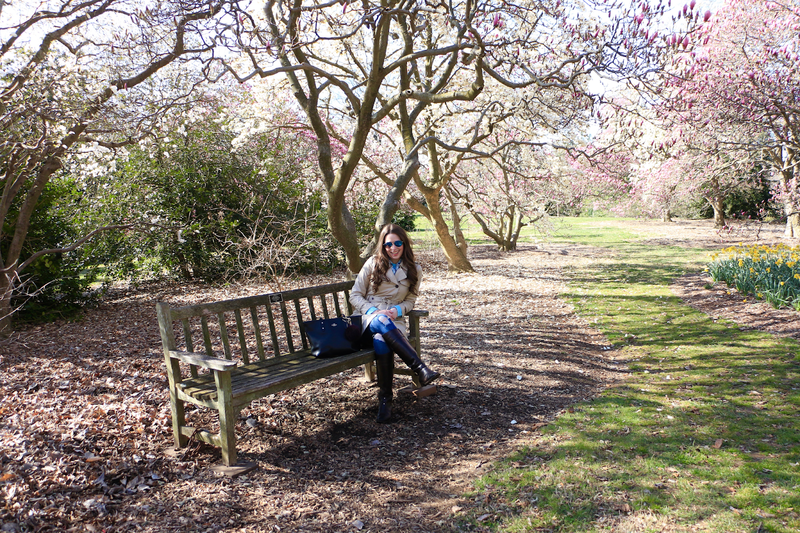 I love Cherry blossom season - though I heard they might just cancel the festival this year because it's been so cold! I hope they don't! Such amazing photos! I love cherry blossom season, though I've only got to experience them once and not in DC, unfortunately. I am dying to see the Cherry Blossoms in DC! Now I really wish I didn't have plans and could go down there this weekend! 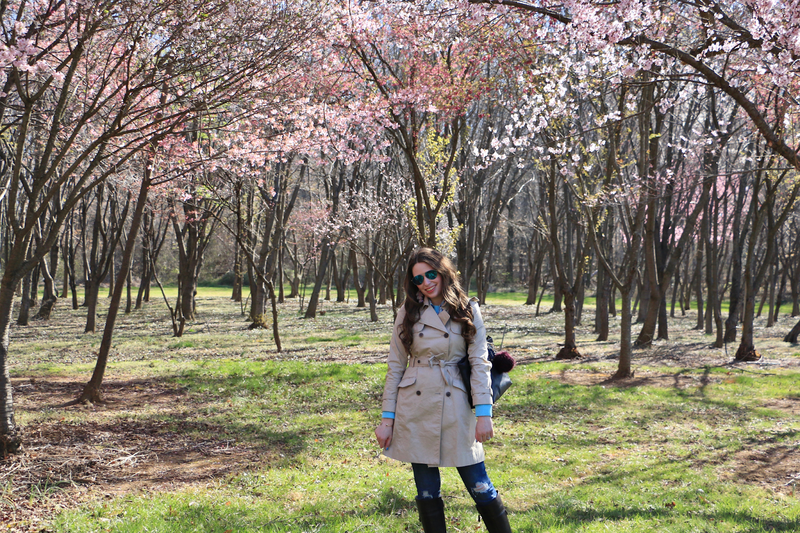 I've been to D.C. a few times as I have family in the area but I have never been for the cherry blossoms- so pretty! You got some lovely photos! I never knew cherry blossoms were such a big deal in DC. I managed to stumble across some while visiting my brother in Michigan last year and they are so beautiful. Now this is on my list of places to visit! It's just so gorgeous! I love DC so much but have never been to see the cherry blossoms! It looks absolutely magical! !